I am inspired by songs that reference scripture. The best way that I have found to be reminded of scripture on long days, is to be able sing a song that incorporates truth from scripture. 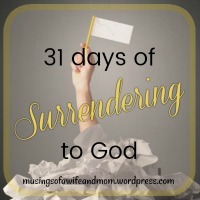 Over the next 31 days using the 31 days of five minute free write prompts over at http://creativeandfree.com, I will take a journey through some of my favorite worship music and the scriptures that these songs are based on. Thank you for joining me on this journey.